Millions of Americans can’t sleep at night. If you’re amongst them, you have plenty of options…but most of them are pricey. 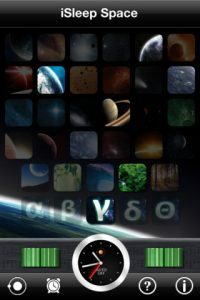 Skip the expensive sleep machines and habit-forming prescription sleep aids and try outiSleep Space, an innovative iPhone app developed by Atom Systems Incorporated. iSleep Space is a tool that helps foster restful sleep, meditation, or relaxation. 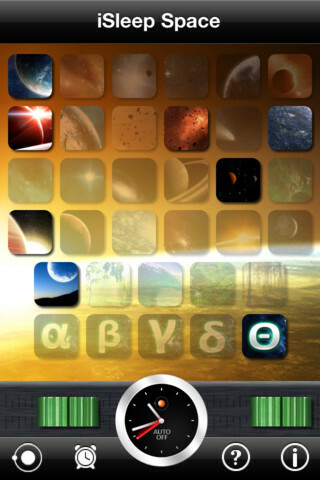 You can select from any combination of 24 restful sounds (though you can only play 12 of them at one time.) In addition to nature-inspired noises and more abstract sounds, you can also tap into sounds designed to stimulate your brain waves and trigger restful feelings. 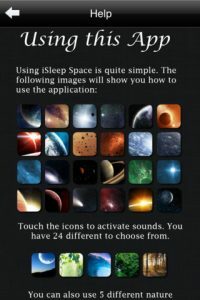 The audio in the iSleep Space app is of a very good quality, with each sample sound looping perfect for listening to audio without interruption or clicking, creating a restful, seamless user experience. Interestingly, the audio has been cut below 80 Hz so as not to overlap with the alpha waves created by your brain. 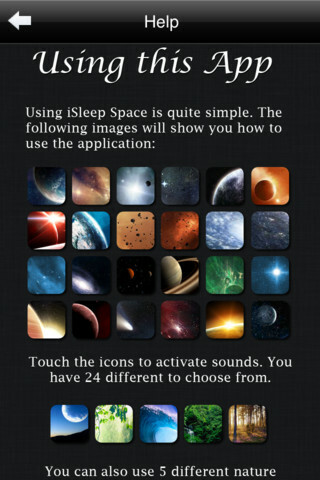 The binaural tones used by iSleep Space work in concert with ambient tones produce a feeling of well-being. Thoughtfully, iSleep Space has a ton of information about brain frequency research included right in the app, allowing you to make an informed decision about whether you want to use alpha, beta, delta, gamma, or theta waves in your relaxation time. 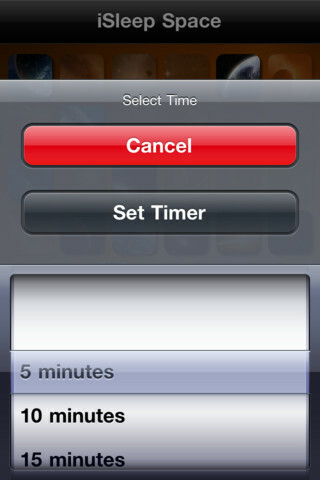 The user interface is excellent and intuitively designed. In addition to being easy on the eyes, iSleep Space as a bunch of great features to increase usability. These include a timer function to help you maximize your power naps, as well as an automatic mode that generates random combinations of sounds so you don’t have to. While your results may vary, iSleep Space is an iPhone app that is definitely worth checking out if you need better sleep, improved memory, or just a way to improve your relaxation time. 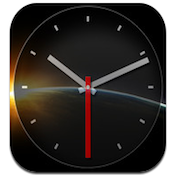 iSleep Spaceis compatible with iPhone, iPod touch, and iPad. Requires iOS 3.1.3 or later.A small expedite fee was paid by the developer to speed up the publication of this iPhone game review.